Aelfwic is a cold hearted Prince with designs on the royal blood of Mercia. To this end he sent his brutes abroad to seize the Princess Gwerfyl and bring her to him. They stole into her castle and there overtook her guards and bore her off into the dark. She fought, but to no avail, for with them were strange magics and a haunt of weirdling power. Many followed the trail, taken up after a father's desperate call, but few returned, and none with the Princess. And she vanished into the east, prisoner of a Prince most foul, to lie in the dungeons of her captor, bereft of hope. A Shattered Night is complex adventure of intrigue, and espionage. It involves a wild hunt across ancient forests to find the Princess. But once done, its no easy task to free her. The force of arms carries an adventurer far, but at times stealth and care carry them further. The game is afoot! Set in a semi-historical mythical Post-Roman Britain, in the Mercia and the east Saxon kingdoms, A Shattered Night has a strong element of the faery-folk and druidic magic about it. This module can be easily placed in the Airhde world setting or any other with an easy change of names. 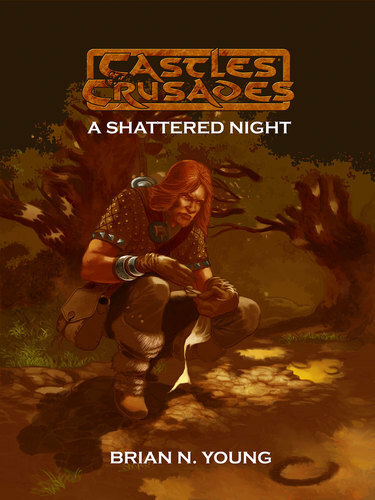 A Shattered Night is an adventure for 2-5 characters, of 4th-6th level.